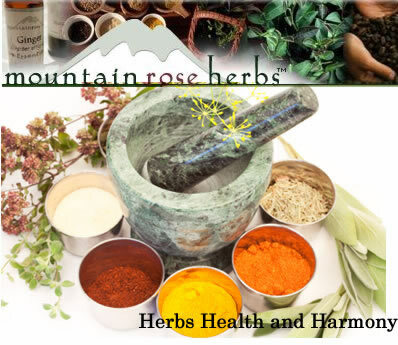 Mountain Rose herbs is my absolute favorite source for organic bulk herbs, spices, and oils. They stock all the bulk craft and herb items any home herbalist needs and also have an incredible line of naturally crafted botanical bath and body care products. An ethical, customer friendly, green company, Mountain Rose offers friendly personal customer service and exceptional quality along with the best organic herbal products at very competitive prices. I trust and use these products for my family's health, and you can find all the fresh herbs, oils, teas and supplies you need to make all the remedies featured on this website. Bulk Herbs The best herbs are grown fresh in your own backyard, but Mountain Rose Herbs is a close second. They have the best selection of organically grown herbs you will find on the internet. You can buy bulk herbs from them knowing that they will be fresh, pure, and exactly what you need to complete your home herbal stash. Aromatherapy A wide selection of essential oils, and some really cool custom blends. You will also find aromatherapy supplies including lamps, diffusers and sprays. Aromatherapy kits and gift sets are let you experience new and exciting oils for a reasonable price. Bulk Ingredients The essentials you need to make your own herbal recipes. Carrier oils for aromatherapy and body care, body butters, cosmetic clays and salts, put some miscellaneous items such as borax and castile soap that you don't want to forget. Bulk loose leaf teas. Everything a tea enthusiast could dream of, black, green and white teas, plus some awesome blends. Annie's favorites are organic chi and Mango Ceylon tea . Try them you won't be disappointed. Copyright © 2005 - 2016 Annie's Remedy * All rights reserved Citations Feel free to cite information given on these pages with a link to: Anniesremedy.com . Fair use of this copyrighted information is limited to small snippets of text.